All countries aim to improve housing conditions for their citizens but many have been forced by the financial crisis to reduce government expenditure. Social housing is at the crux of this tension. Policy-makers, practitioners and academics want to know how other systems work and are looking for something written in clear English, where there is a depth of understanding of the literature in other languages and direct contributions from country experts across the continent. 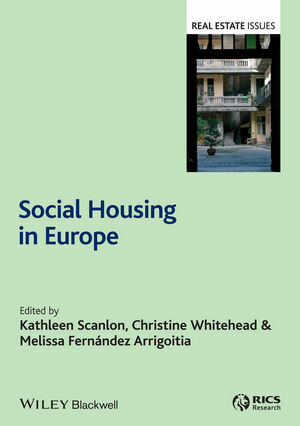 Social Housing in Europe combines a comparative overview of European social housing written by scholars with in-depth chapters written by international housing experts. The countries covered include Austria, Denmark, England, France, Germany, Hungary, Ireland, The Netherlands and Sweden, with a further chapter devoted to CEE countries other than Hungary. The book provides an up-to-date international comparison of social housing policy and practice. It offers an analysis of how the social housing system currently works in each country, supported by relevant statistics. It identifies European trends in the sector, and opportunities for innovation and improvement. These country-specific chapters are accompanied by topical thematic chapters dealing with subjects such as the role of social housing in urban regeneration, the privatisation of social housing, financing models, and the impact of European Union state aid regulations on the definitions and financing of social housing.